Denise Crosby is an American actress. 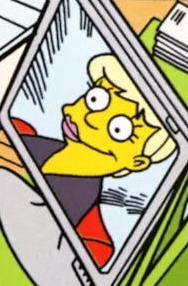 Comic Book Guy saw the blu-ray edition of Star Trek: The Next Generation including a special feature highlighting the best moments of Denise Crosby as Tasha Yar. Comic story – Bart's Invisible! Modified on December 11, 2014, at 16:55.